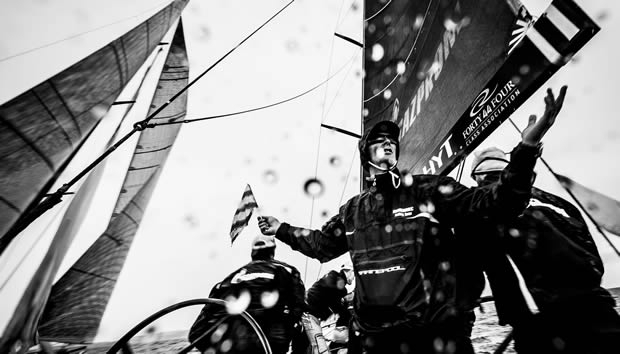 'The rain in Spain stays mainly on the plain', but for the opening day of match racing, prior to the start of the RC44 World Championship Marina de Sotogrande fleet racing tomorrow, the Andalusian port received an unseasonal, but thorough soaking. 25km away, Gibraltar was obscured by cloud, as the match racing, which rolls from regatta to regatta over the RC44's annual championship, only reached its second flight before there was a giant shift, the wind shut down completely and the boats were sent in. With just one and a half flights sailed, two boats still managed to end the day on two wins – 2015 RC44 fleet racing champion, Vladimir Prosikhin's Team Nika, and Chris Bake's Team Aqua, winner of both the match racing at the fleet racing at this seasons' opening event in Bermuda in March. Owner Chris Bake, who helmed Team Aqua through today's grey conditions, described their races: "In the first against Bronenosec Sailing Team, there was a dial-up at the start and we just managed to get ahead of them off the line. Against Aleph Racing in race two we did a tacking duel up the windward leg, but for the rest of the race it was a fool's game - anything could have happened." Another team doing well today was Artemis Racing Youth which won its first match against Alexander Novoselov's Katusha and appeared to be leading against wily Dutchman Nico Poons on Charisma. "Unfortunately we had a penalty from an unforced error at the start," explained Artemis Racing Youth's helmsman, Gustaf Lidvall. "We were leading, but at the gate the wind completely shut down. We parked and then Charisma came in, got the new breeze and took off!" Lidvall believes Artemis Racing Youth, Torbjörn Törnqvist's campaign that seeks to develop young Swedish sailors, is improved this year. They have new sails, are making less errors and fellow Swede and three time Olympic medallist Freddie Lööf is now calling tactics. "When we raced Katusha today, we were definitely faster than her. But it's really all the little things," said Lidvall. The consensus in the fleet was that Principal Race Officer, Maria Torrijo, was right to send the fleet in. As Katusha's American tactician, explained: "The clouds were coming right to left, so when they were coming there would be seven knots out of the right and then the cloud would come over and it would completely stop and then it would be three knots out of the left with probably a 120° shift between and there was about a knot of current as well."